First Look Wedding Photos: Is it a "Do" or a "Don't"? First Look Wedding Photos: Is it a “Do” or a “Don’t”? One of my most favorite moments as a wedding photographer is when the bride and groom see each other for the first time. This special moment can happen one of two ways – first – the more traditional way is when the bride steps through the doors and the groom sees her from the front of the ceremony space. 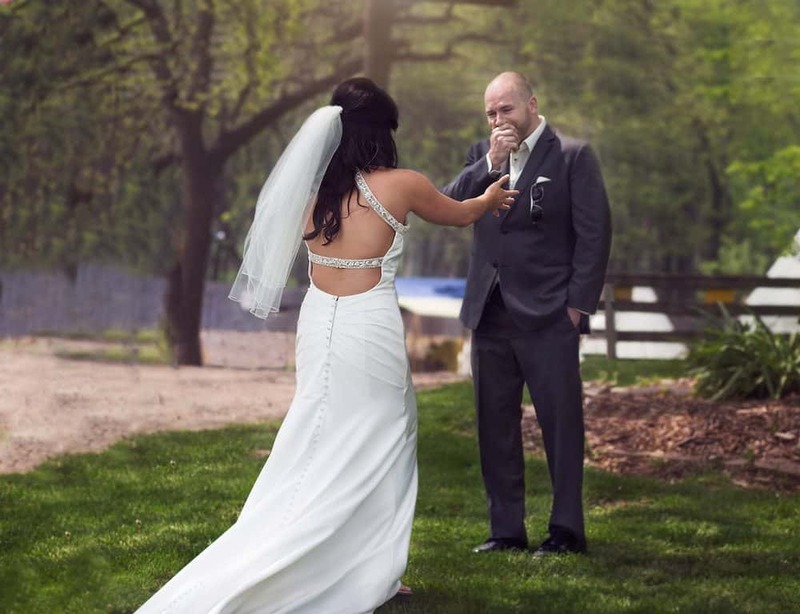 The other way – which is a more recent addition and tradition – is staging a semi-private meeting of the bride and groom prior to the wedding ceremony also known as a “first look”. I’ll leave you to decide – but here’s why I recommend the “first look wedding photos” option myself as a Portland wedding photographer. Here are reasons why I think first look wedding photos are a DO! Your wedding day will be full of craziness. Setting aside this time can help you focus on why you’re here and see your fiancé in private before all the hoopla begins. Granted – I’m a bit biased – but the reactions you see on the faces of the bride and groom when they first see each other is pure bliss and truly – a raw reaction – which when captured – make for the best photos – at least I think! If you see each other before the ceremony, this will also allow you to get some of planned wedding photography you want out of the way before the wedding (think wedding party photos and/or family photos). Then you will have more time after the wedding ceremony to get the party started. This can also alleviate stress as you know a big part of the “to-do” list for the day is already checked off. Of course, you’ll look your best on your wedding day, but this gives you time to freshen up prior to the ceremony if needed. Now, I’m not saying you’ll cry upon walking down the aisle (or when you see your bride or groom for the first time) but if you do a first look and happen to shed some tears – you’ll have some time so that you’ll be able to put your best face forward before walking down the aisle – which is what you want when you’re looking back at your wedding photographs on your 50th wedding anniversary! Alas, whatever you do and whenever you decide to see each other on your big day – don’t forget that it is YOUR day and what you decide is most important. 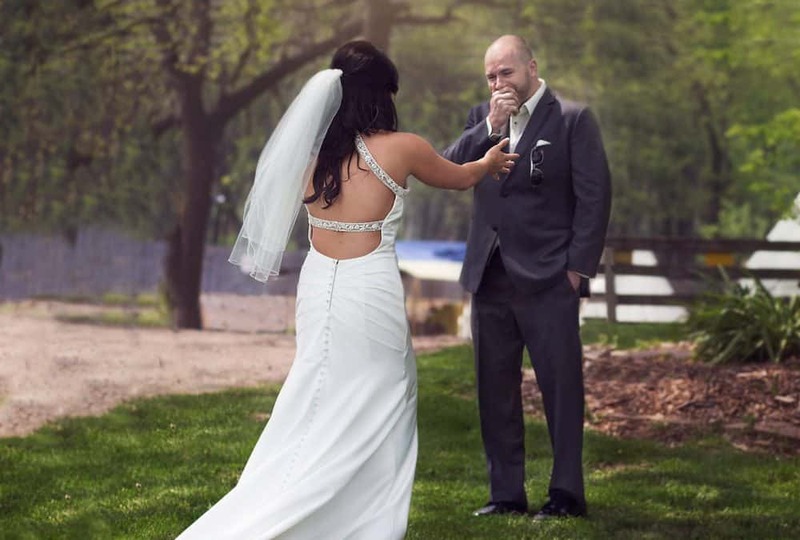 What do you think of first look wedding photos? Are they a Do or Don’t? P.s. Below is one of my favorite first lookmoments! Yes! It’s all about reaction! And I love it! Great reasons! 🙂 First Looks are so sweet! I LOVE this – I so wish I would have done this for my wedding. Now that my daughter is older I can’t wait for her to have a first look! I love the first look tips. It’s always a YES to a first look!